It’s fascinating to see how much of this game comes down to kids fighting the battles of their ancestors. The tales of the past still survived somewhat on the islands across the vast sea, but for the most part, life is able to move past the old battles. There is no Hyrule and no monarchy in place. There is no usurper waiting to destroy the monarchy and replace it. But Ganondorf just can’t let it go. He wants what he fought so hard and so many times to claim, and in the end, he almost realizes the futility of his quest, and how his covetous nature can’t exist in this world. Almost. Unlike his previous battles, his dreams aren’t ripped away by some kid in a green outfit with a magical sword. Instead, it’s the king of Hyrule finally putting his foot down—not just on Ganondorf but on the entire past. He realizes everything that had been dug up from the bottom of the ocean needs to stay there. Ganondorf can’t accept this and ends up turned to stone and buried at the bottom of the sea along with his bane, the Master Sword. From there, the past tales are in the past, and a new tomorrow can start, with both the symbols of good and evil buried at the bottom of the sea. I always interpreted the ending as Ganondorf finally giving up. He specifically chooses not to come back and be reincarnated again. He’s not this evil dictator out for glory and to rule the world—not anymore. He’s a man filled with sorrow and regret and… he’s tired. He does try to gain control over the Triforce one last time, but that only seems to be because it’s all he knows at that point. It’s what he’s done for so long; he has no other course to follow. It’s pure repetition. He needs the Triforce because he wants to return things to the way they were (though, under his authority, of course). When he confronts Link, he says, “Do not fear, I will not kill you… I merely need the power that dwells within you.” And true to his word, once he gains the Triforce, Ganondorf leaves Tetra and Link alone despite the fact that they’re completely defenseless and at his mercy. I don’t think he wants to kill anyone that he doesn’t have to. Don’t confuse this with meaning that he won’t kill—he will absolutely murder anyone who stands in his way—but rather, I think that if given the choice, he would avoid the fighting and killing if possible. Of course, the king steals Ganondorf’s wish, and as Ganondorf stands there, inches away from what he’d been trying to achieve time and time again across multiple lives, he laughs. And laughs. And laughs. He knows this was probably his last chance, and to come so close only to have it stolen away by a man who was cursed to be a sailboat—well, what reaction could there be other than laughter? And then he goes berserk and tries to murder them all. Link stabs him in the head, and before dying Ganondorf says, “Ughnn… heh heh… the wind is blowing…” which is probably a reference to how the wind of his land carried nothing but death. At this point, he embraces his death and turns to stone. To me, the best statement that Ganondorf makes is: “Your gods destroyed you!” It comes when Link first enters the room where Zelda is supposed to be sleeping, and it gives me chills every time. Ganondorf tells of how vast and useless the ocean is—an inhabitable land that the king of Hyrule says is supposed to be hopeful. But Ganondorf scoffs at it and looks down on the hope that the King has. Then, he delivers that line. This is the villain making a statement that is, for all intents and purposes, true. 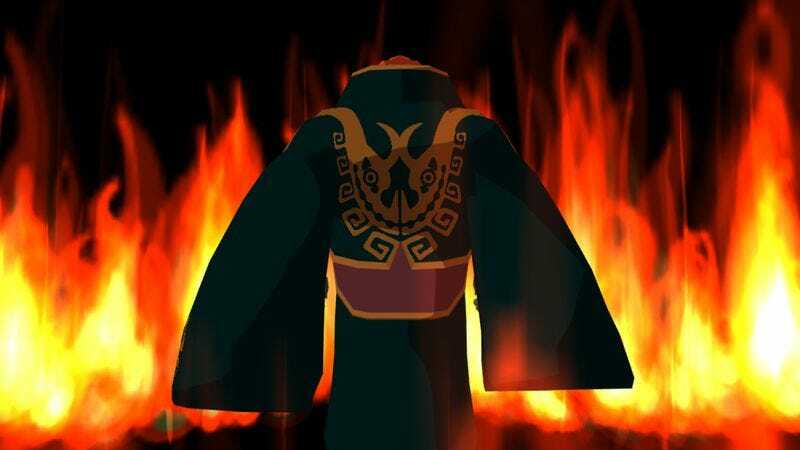 While it was Ganondorf’s fault that the gods had to resort to flooding the land, they were still the ones responsible for, what was essentially, the apocalypse. It makes the pain of what is to follow all the more real. No one has gained anything from the events. The gods stopped Ganondorf from ruling the land, but the people lost their home, anyway. I always read this one as an environmental fable, with the theme of “The world is not inherited from our ancestors but borrowed from our children.” It ends up being about the old generation and their conflicts giving way to the children and the land itself slowly regrowing. Metal Gear Solid 2 saw a backlash from players who were upset because Raiden was not Solid Snake, whose role he occupied for most of the sequel. Raiden has now been accepted as his own character, but it took a few more appearances. Wind Waker was hated when it was first revealed because its cartoon art style was so different from the games that came before it. Fans initially rejected the character that we now call Toon Link, but he too was eventually embraced as a distinct, beloved character. MGS2’s “Plant” chapter is intentionally designed to replicate all the same story beats as the original’s Shadow Moses Incident. When things start going slightly off-script halfway through, with the introduction of unexpected outside variables, the player begins to realize that something is seriously off with the whole experience. The story becomes its own when all of the major players are forcibly brought together, alliances shuffle violently, and the Arsenal Gear is revealed. The story of Wind Waker is all too similar to Ocarina Of Time’s up to the point where you venture into the submerged Hyrule Castle. It is an entirely different environment than anything players have seen up to that point, and it’s where the major players all diverge from their expected paths, condemning the old Hyrule in the process. Both games seemingly chastise the player at this point for wanting more of the same, and while it gives it to them at first, it forcibly takes it away to deliver a heavy-handed message—whether the audience wants it or not. Finally, the ones who attempt to wrangle the narrative to a strict sequence that suits their own ends are the villains, Solidus and Ganondorf. They both believe that there is only one realistic state of affairs for the heroes, themselves, and the world, and they use all of their might to ensure it, even at the cost of their own lives. The endings of both games see the death of the villain and the ultimate rejection of the expected outcomes, but the story isn’t over and goes on with an uncomfortable and unpredictable path, free from the bonds of recursive folklore, as well as the player. The ultimate moral of both games is to expect more diversity from our culture and stop being so dependent on what worked before. Otherwise, it’ll be all we ever have to show for ourselves as a civilization. MGS2’s ending is a warning to society as to what will happen if we don’t change, and Wind Waker shows the direct result of it. Also, I don’t know if this means much, but strangely enough, both games came out around the same time (MGS2 in 2001 and Wind Waker in 2002, which makes the last sentence of the previous paragraph even more poignant). And they both take place out at sea. And with that, we’re signing off for the week. Thanks for reading and commenting. We’ll see you all next week!